Welcome to Flash Fiction Friday and the fiftieth piece in this series. This week’s is a 996-worder (to be read / imagined in an Geordie accent) by octogenarian memoirist, non-fiction and fiction author, and interviewee WH ‘Johnnie’ Johnson. But Mam was different. She always saw the good side of people, always wanted to help. “I can scarcely breathe, missus. There’s no betterness for the flames,” Mrs Elstob would tell her. “Unless you’ve gorra bowl of soup or summick you could let us have.” And then she’d go back into the house, put her head under a towel and snoke up the fumes of Friar’s Balsam. Not that I knew much about how much the Elstobs scrounged off Mam. I don’t know how she could afford to give anything away. What I do know is that she never let on to Dad. But for me there were more important things in life. Especially that Wednesday morning in the last week of August when, hard up as they were, Mam and Dad gave me a bike for me birthday. They’d been saving up for it. It wasn’t new but it was beautiful. I rode it every possible minute. On the Friday morning I was still wobbling about. Then, as if by magic, I mastered it. On the Saturday I was riding with no hands. Course, our Maureen was out in the back lane, spying on me. “I’ll tell if you don’t use both hands,” she kept saying. At about half-past ten on the Sunday morning, she was there again. It wasn’t obvious to me. About ten to eleven when I was leaning me bike on the back lane wall, the Elstobs came out of their back door. Then he saw the bike. He hadn’t seen it before but now he was giving it the once-over, inspecting every part like an expert. Then Mrs Elstob inspected it. “Ee, it’s lovely, pet,” she said. Just then, Mam came out into the lane. Mam blushed with pleasure and then Mrs Elstob cut in. “And five Woodbines. And a bottle of Newcastle Brown.” Norman was rubbing his hip. Obviously it was giving him gyp. “Make sharp, then,” Mam said. Up at the corner shop I was the only customer. But old Harding only went one speed. He rummaged round in a tangle of skipping ropes, bundles of firewood, kippers and bottles of Tizer. He sniffed again but he gave me the tabs. “I divn’t sell beer to bairns,” he said. But I got it all the same. Shortly after eleven o’clock I was home. It was quiet in the kitchen. Dad sat scowling at the wireless. Our Maureen was staring at the wall. Mam said nothing, just handed the things to the Elstobs. “Very kind,” Mrs Elstob said. Then suddenly Dad stood up. You could tell he was angry. “Now, then,” Mam began to say. I’d never before heard him speak so sharply to her. And the Elstobs just turned and went out with not one word. Dad followed them to the top of the stairs. You could’ve heard him in Jarrow. He came in and went to the window, looking down into the backyard. I’d never seen him so angry. “He should have been here,” he said again. Dad wanted me there. He hadn’t said anything beforehand to his eleven-year-old son. But he wanted him there. On that great, terrible occasion. To hear it. To feel history happening. And that boy would have been there if it hadn’t been for the flames on Mrs Elstob’s chest and Norman’s beer and baccy. Ever after Mam still defended the Elstobs though they never came to the house again. Dad, of course, never wavered and never forgave them. Nobody ever thought of blaming Adolf Hitler. I had sensible, loving parents – not the sensible, loving ones in the story, by the way – who made what I consider to be a major error on the day war broke out. I was eleven years old and out on my bike that Sunday morning and they didn’t call me in to hear the broadcast. I cannot understand it and have always had some sense of resentment that I missed that important historical moment. I can’t work out why this happened: did they think I was too young to understand? Was my father who served in France from 1916 to 1918 somehow unwilling in a curious sense to draw me into this war? Anyway, when I got in they told me that we were at war and then, just at that dramatic moment, the air-raid sirens started wailing. I think that everyone must have thought that the Germans were pretty quick off the mark. And by the way, I was an only child. Our Maureen is purely imaginary. 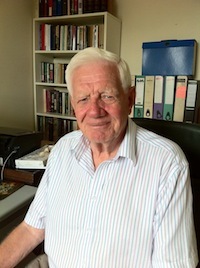 Johnnie Johnson has been retired since 1988 since which time he has written 25 books including two novels. Most were traditionally published, others, such as the recently published e-travelogue, A VIRGIN IN THE PHILIPPINES, have been self-published. His website is www.johnniejohnson.co.uk. Johnnie, because he has the original accent, has kindly agreed to record his story for this podcast which will be released on Sunday 2nd December. The blog interviews will return as normal tomorrow with mystery writer and publishing interviewee Patricia Rockwell – the four hundred and seventy-ninth of my blog interviews with novelists, poets, short story authors, bloggers, biographers, agents, publishers and more. A list of interviewees (blogged and scheduled) can be found here. If you like what you read, please do go and investigate further. And I enjoy hearing from readers of my blog; do either leave a comment on the relevant interview (the interviewees love to hear from you too!) and / or email me. Unfortunately, as I post an interview a day (amongst other things) I can’t review books but I have a feature called ‘Short Story Saturdays’ where I review stories of up to 2,500 words. Alternatively if you have a short story or self-contained novel extract / short chapter (ideally up to 1000 words) that you’d like critiqued and don’t mind me reading it / talking about and critiquing it (I send you the transcription afterwards so you can use the comments or ignore them) 🙂 on my ‘Bailey’s Writing Tips’ podcast, then do email me. They are fortnightly episodes, usually released on Sundays, interweaving the recordings between the red pen sessions with the hints & tips episodes. I am now also looking for poetry for Post-weekend Poetry. I really like Johnnie Johnson’s use of spoken language, it’s wonderful. Thank you!